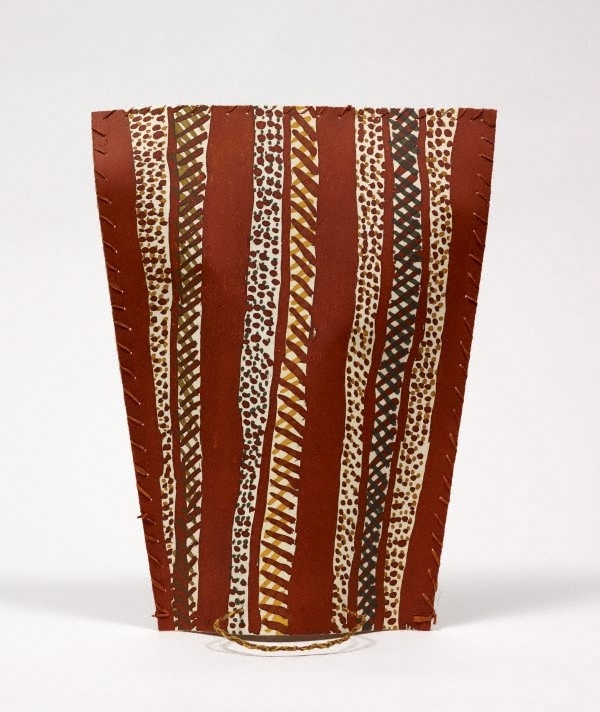 The specific geometric designs that are the hallmark of Tiwi are art known as mulypinyini pwanga (lines and dots) and these form a common basis for many of the abstract designs found in the work of Tiwi artists including Jean Baptiste Apuatimi. Apuatimi began painting in the mid 1980s following the death of her husband Declan Apuatimi, himself a distinguished artist. During the start of her career she painted alongside Kutuwalumi Purrawarrumpatu (Kitty Kantilla) and similarities may be drawn between the refined minimalism that dominates both artists' works. Signed inside lip of tunga, pencil "Jean Baptiste". Not dated.